The combination of lines and colors is one of the most expressive tool sets an artist has at their disposal. Nearly infinite in its variety, this combination, when used with thought and purpose, can propel an otherwise mundane drawing to new heights. This combination of line and color has been mastered by many artists throughout the centuries, but few did it better than Alphonse Mucha. 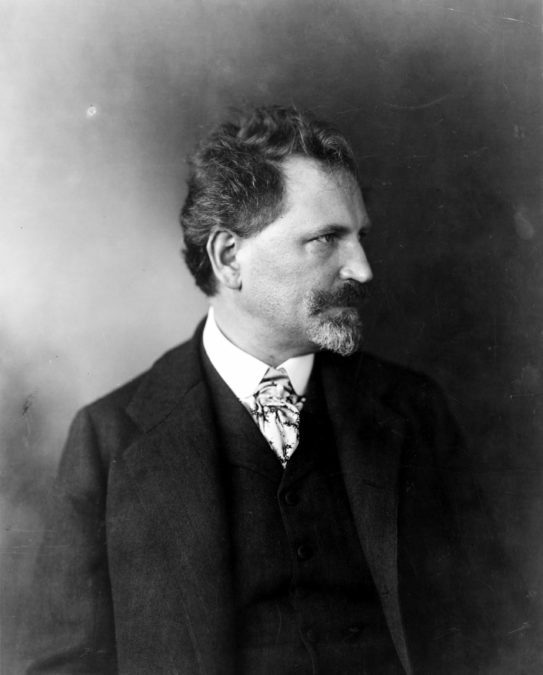 Alphonse Maria Mucha was born July 24, 1860 and died July 14, 1939 after contracting pneumonia while being interrogated by the Gestapo. A prolific artist, Mucha created works on canvas, as well as designs for furniture, silverware, glassware, advertisements, and more. Mucha’s work most frequently contrasted beautiful young women with decorative motifs like flowers and lavish borders, set off with soft pastel colors and bold lines. While his art is enormously influential today, by the time of his death his style was considered outdated. Thankfully his work is now more popular than ever and we can readily admire it for ourselves. 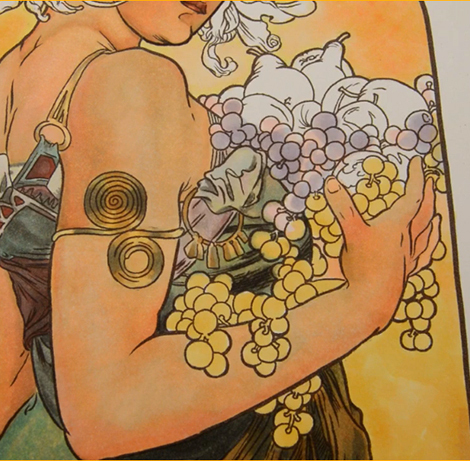 Mucha was a master of both line and color, and while a thorough discussion of his line work would take more space than I have in this blog post, we can still learn to create the effects of his line and color work in combination and then apply the concepts to our own work. 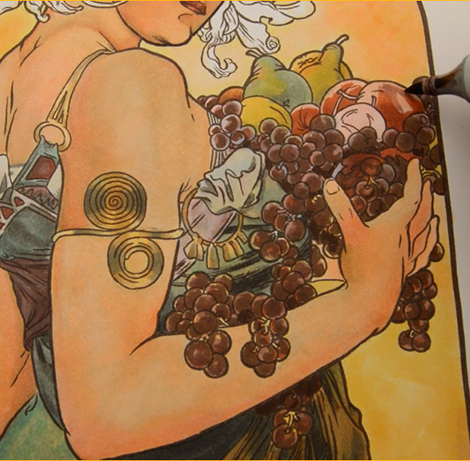 For this tutorial we will be working with a section of Mucha’s “Fruit”. I chose this section because it exemplifies the effects of bold line work and subtle color effects. I lay in a rough, uneven base color of R20 on the upper bunch of grapes and a similar uneven base layer of YR31 on the lower bunch. I add BV31 to the upper bunch, leaving plenty of the original R20 to show through, especially on the “tops” of the grapes. I darken the grapes with E04, leaving some of the R20, BV31, and YR31 still visible in the individual grapes. I add darker accents with E27, add stronger color back into each grape with E04, and then restate my darks with E18 to finish the grapes. I add YR21 to the peach and orange. (The base for the peach is E04 and was colored with the grapes). I then add YR31 to the “what the?! ?” fruit in the foreground… and to the far pear. I add W4 accents to both pears and the foreground fruit, then soften the W4 with W2. I color the bottom of the plum with E27. I use the same E08/E27 combo for the other plum, then add BV00 to indicate the highlight. Turning my attention to the apples, I lay in a base with R20, and then “warm” the tops with E00. I darken the bottoms with E08, and then add cooler touches with E04. I soften it all together with R20, then restate my “reds” with E08 to finish the fruit. As you can see, the combination of line and color can do amazing things. Unfortunately, too many artists think of line as a simple color boundary – an area of the drawing where color stops – but line and colors are so much more! So go ahead and try your hand at it. I think it’s a quince, and you got the color right for it! What a quincedence Laurie, I thought it was a quince! Actually, I have no idea what a quince is lol, but thank you for filling me in, I really appreciate it 🙂 I’m also happy you liked the tutorial. Thank you for the awesome comment! AWESOME!!!!! Thanks for sharing your talent!!!! Thank you, Pam. We’ve missed you around here! Hey Buddy!, I found this information for you: "Coloring Mouthwatering Fruit: An Art Nouveau Tutorial". 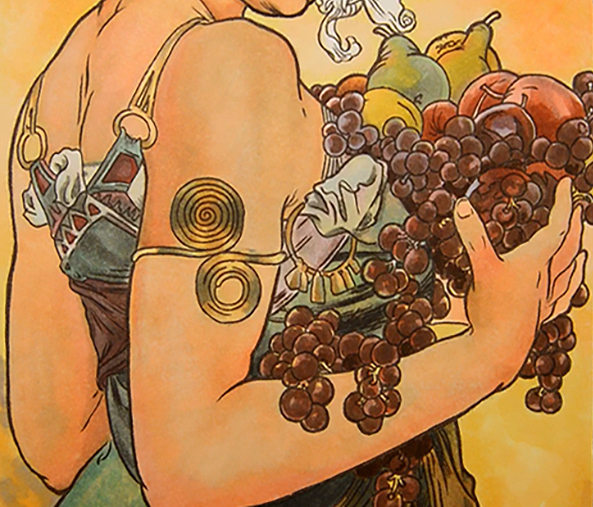 Here is the website link: https://copicmarkertutorials.com/coloring-mouthwatering-fruit-an-art-nouveau-tutorial/. Thank you.